After Betrayal: Now What? After Betrayal: Now What? You didn’t see it coming. But your broken heart tells a different story. You’ve been betrayed. The pit in your stomach, the inability to think clearly, the loss of security and everything you thought you knew. You question your future, your kid’s future, and worry settles in like an uninvited cat. You’re faced with decisions on how you will respond. What do you do next? The feelings of betrayal can be so intense that you can feel completely off your game and unlike yourself. I think that is where the phrase, “beside myself” came from- feelings of betrayal give us a sense that we are outside of ourselves powerlessly watching the bad thing happen. Last week, we discussed what true repentance looks like, and without true repentance, reconciliation is not possible. If you missed it, click here to read. 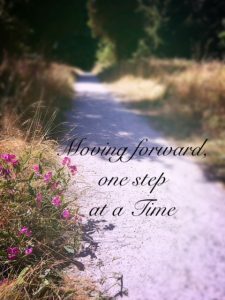 How do you put together the pieces again, and make sure that you move forward instead of get stuck in anger and bitterness? Determine the state of repentance your partner is experiencing. Repentance means that your partner identifies the gravity of the injury, makes reparations and commitment for change. Last week’s post addressed the steps in true repentance. Click here if you missed it. List your needs: this may be difficult if you haven’t been in the habit of recognizing and asking for your own needs. You may be out of practice when it comes to identifying what you need, because you’re used to feeling other’s needs first. Take some time to list some things that you’ll need, in order to move forward. Maybe you need your partner to go to counseling, go to a 12 Step program, come clean to your family, switch jobs, join a marriage group at church with you, or take a parenting class. Determine if reconciliation is an option. Remember, forgiveness does not mean that you have to trust or reconcile with the other person. You do not. Reconciliation is a much different process than forgiveness. Forgiveness can be done with or without the offending person’s repentance or willingness. If the offending person has proven himself emotionally safe, trustworthy and remorsefully repentant, then reconciliation can be an option. If he only offers lip service, without true behavior change, then reconciliation is not a safe idea. 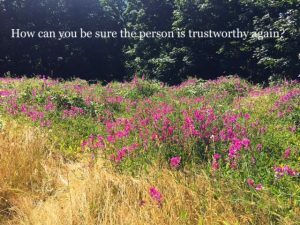 If the offending person offers no admittance of wrongdoing at all, he is showing you that he is not a safe person to trust again. Recognize your own part, if appropriate, in the breakdown. I’m not saying that the betrayal is your fault. Not at all. However, it is important to identify your contributions to the breakdown of the relationship whatever they may be. Maybe you ignored some warning signs, or neglected to set good boundaries in the beginning. Maybe your people picker was broken and you picked the wrong person. Maybe you tolerated disrespect too long. This is an important step to your recovery because it prepares you for self-forgiveness. Determine what Forgiveness looks like for you. Forgiveness is choosing to no longer hold the person accountable for that particular transgression. It’s as if the trial is over, the sentence is in place, and you no longer have to be the judge, the jailor, or the enforcer. You may be experiencing fear of getting hurt again, but don’t let that fear determine whether you forgive or not. Forgiveness may mean that you reach out to the person and offer to take steps toward reconciliation. Or, forgiveness for you may mean wishing the person well, and keeping your distance. Signs of forgiveness. How do you know if you’ve really forgiven or not? Well, you’ll experience less anger, hurt and fear when you are with or when you think about that person. You feel confident that you can take care of yourself, and wise about decisions you make. You feel compassion for the other person, and truly wish the best for him/her. Whether or not they have changed, you have peace with yourself and extend peace toward him/her. 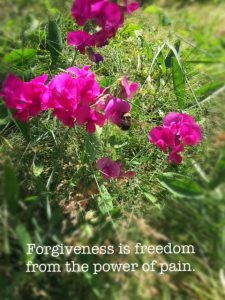 Forgiveness is the freedom from the power of past pain. Before agreeing to “Work things out” after betrayal, it is important to take the time you need to discern your true feelings about this. Since trust has been broken, it takes time to see whether your partner has what it takes to repair trust. True friendship and love cannot exist in an unsafe relationship, so give yourself permission to take your time and space to determine the safety of the relationship.